TWO DÁIL BY-elections this weekend have given us an insight into voters’ thinking five months after the government got a “shellacking” in the local and European elections. Socialist Paul Murphy and independent Michael Fitzmaurice have been elected to the Dáil amid strong anti-government sentiment in both Dublin South-West and Roscommon South-Leitrim. It appears Labour and Fine Gael still have a lot of work to do to convince voters that they are worthy of their support in the run-up to the next general election. A tax cut in next week’s Budget might help, but it’s clear the electorate are still angry at the coalition. While running under the Anti-Austerity Alliance banner, the Socialist Party remains a political brand and an ever-growing one after Paul Murphy was a surprise winner in Dublin South-West. The Socialists now have an unprecedented three TDs in the Dáil and clearly struck a chord with voters when they told them to boycott the water charges. Sinn Féin’s failure to take a seat it has long-targeted is a big blow for the party that has been on the crest of a wave since its local and European election success in May. Just this week, the party pulled level with Fine Gael in the polls. But its confused message on water charges is likely to have done some damage given the Socialists’ message was simple: Don’t pay. It’s an extraordinary state of affairs that there have been six by-elections in the current Dáil term and Fianna Fáil has not managed to win any of them. The party will argue that it has managed to improve on its 2011 vote share in most cases. But failing to increase its Dáil numbers yet again will be deeply worrying for Micheál Martin who did all he could to get Ivan Connaughton elected in Roscommon South-Leitrim. Expect more questions about Martin’s future as party leader in the coming weeks despite there being no obvious successor. He insisted (as you might expect) at the Roscommon count centre that there was “no question” of his leadership being under pressure. The outspoken independent was in flying form yesterday afternoon, as the early tallies showed that the man he’d backed was likely to succeed him as a Roscommon-South Leitrim TD. Speaking to TheJournal.ie last month, Fitzmaurice said that while the two men were working closely together, it was too early to start talking about a new political party. Ming echoed that sentiment, saying he wasn’t envisaging anything so structured as a registered and branded political organisation. He will be looking at ways to keep ‘Planet Ming’ properly organised, however — and said his experience in Europe had given him an insight into how to organise groups of like-minded politicians. There’s no question that the success of Fitzmaurice and the ‘Ming’ organisation will have further shaken up the political establishment in Roscommon-South Leitrim. The traditional ‘Fine Fáil or Fine Gael’ dynamic in the county is now firmly thing of the past. At the 2007 General Election the make up of the three-seater was FG, FF, FG. But following Denis Naughten’s defection from Enda Kenny’s party over the Roscommon hospital issue, and Ming’s success three years ago, there’s now just one politician from the Civil War parties – Frank Feighan – clinging on in the constituency. Expect another independent-heavy field in the next general election. Emmet Corcoran -the young entrepreneur from Strokestown – put in a strong showing, securing over 1,200 first preferences with an almost non-existent campaigning budget and no posters…. He’s considering another run for the Dáil, he told us, and could run in a north-south pact with a like-minded candidate. That said, the constituency is set to absorbed into two new constituencies, Roscommon-Sligo and Sligo-Leitrim next time, so at this juncture it’s almost impossible to say how the whole shooting match will play out. The party was never going to win either of the by-elections, nor even come close but there were tentative signs of the junior coalition partner being viewed more favourably on the doorsteps, particularly in Dublin South-West. Candidate Pamela Kearns noted a far less hostile reception than what she had received during the local elections in May. A lot of that might be down to Joan Burton but it’s all small steps in the right direction after a torrid three years for Labour. However, compared to Kearns’ mid-table performance, the party had a disastrous showing over in Roscommon-South Leitrim with John Kelly — a sitting senator, and relatively high-profile candidate — finishing behind hospital campaigner John McDermott. It may be a case of ‘lot’s done, more to do’. Maura Hopkins put in a very strong performance in Roscommon South-Leitrim but in truth she was hampered by the ongoing hospital controversy there and no doubt lost a few votes over ‘McNulty-gate’ and general unhappiness with the government. In Dublin South-West, Cáit Keane ran a solid campaign but simply wasn’t able to appeal to voters outside her strongholds around Templeogue. Keane intends to work the whole, redrawn constituency ahead of the next general election and she will be pushing to be on what is likely to be a two candidate ticket for Fine Gael. Fintan Murphy (below), the returning officer yesterday in Roscommon South-Leitrim, is Paul Murphy’s uncle. Speaking to us at the end of the (long) night, a beaming Murphy said he was delighted for his nephew, a “very hard-working” campaigner who he believed would make a great TD. He doesn’t necessarily share the younger Murphy’s politics, he added. - additional reporting from Daragh Brophy in Roscommon South-Leitrim. Email “Here are 8 things we learned from yesterday's two Dáil by-elections ”. 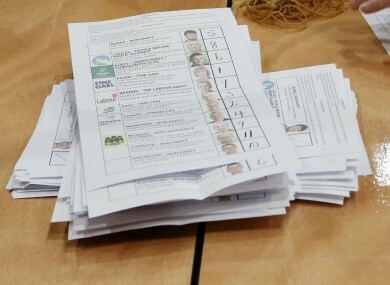 Feedback on “Here are 8 things we learned from yesterday's two Dáil by-elections ”.